The Pacsafe Camsafe X25 Backpack is a travel bag that protects your camera gear with a built-in rain cover. The bag fits a 15" laptop, and comes with security features like RFIDsafe blocking pocket, PopNLock security clip for enhanced security. 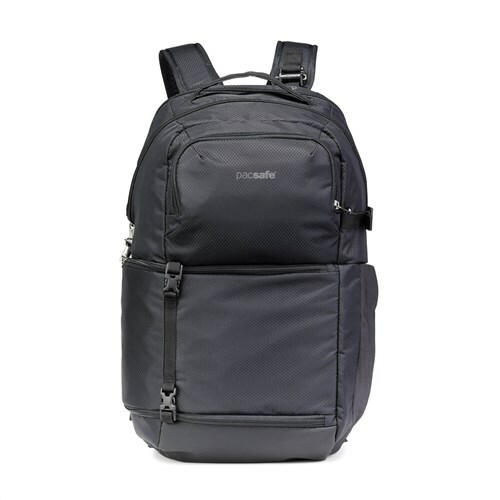 The backpack also has extra features like an internal pocket along with internal attachment points for items such as wallets, keys and other accessories. The bag comes with Velcro Dividers along with a pen loop & water bottle pocket. The Pacsafe Camsafe X25 Backpack has top-tier construction combined with anti-theft technology that will keep up with any adventure & keep your valuables secured. The Pacsafe Camsafe X25 Backpack has many exciting features for users of all types. 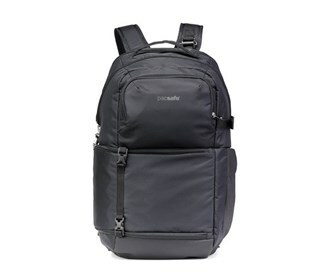 See the Pacsafe Camsafe X25 Backpack gallery images above for more product views. The Pacsafe Camsafe X25 Backpack is sold as a Brand New Unopened Item.